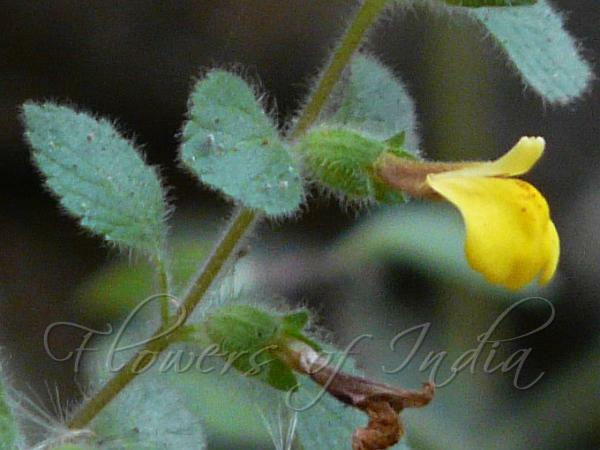 Indian Lindenbergia is an annual herb, 10-30 cm tall, stem glandular-hairy, and grows on bare rocks. It has much branched, hairy stems, rooting from lower nodes. Leaves have coarsely toothed margins, and are covered with spint hair, making them look like stinging nettle leaves, 2-4 x 1-3 cm, ovate, pointed, velvet-hairy below. Yellow flowers solitary or in terminal spikes or racemes. The petal structure is basically 2-lipped, tube tubular - the lower lip is larger and is distinctly 3-lobed, upper lip shortly 2-lobed. Ovary is ovoid, hairless, style threadlike. Capsule is 3 mm long, oblong, hairy at tip, seeds minute, ellipsoid-oblong. It is found growing on rocks in lower Himalayas and all over the country on damp, old walls. 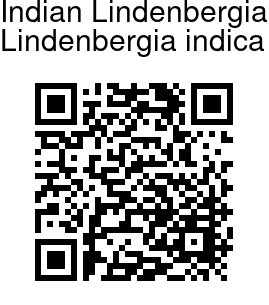 Identification credit: Uluberia Botanical Institute Photographed in Mussoorie.